The 70's were full of Midwest rock bands, endlessly touring every single night, a number of them signed to major labels, hoping they would break out with a national hit. 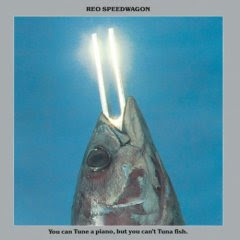 I already discussed Ted Nugent in this category, and here's another one, REO Speedwagon, out of Illinois. These were the days when record companies were extremely patient in developing their acts, that it's almost unheard of today. The album that "Roll With The Changes" came from, You Can Tune A Piano, But You Can't Tune A Fish, was the band's seventh album on Epic Records. And this was before they became a total mainstream success. "Roll With The Changes" fits the mold perfectly as an opening song on a rock album or even live. It shows that before they sold a bazillion records with power ballads in the 80's, these guys knew had to play. Produced by the band yet engineered and mixed to sound big and impressive, the song is all based on simple fast piano arpeggios played in a repetitive C major, F major, Bb major, F major, C major pattern -- a common chord pattern, yet arranged with a streamrolling pumping beat. Once that curtain lifting piano section is introduced, the guitar comes scratching down the neck into the whole band leaping into the battle. Cronin, a curly long-haired dude whom I would not describe as a pretty boy or even looking like your traditional rock star, had this nasal voice with a heavy Midwestern accent (notably on his pronunciation of the letter "R" -- listen to the way he sings "forever" on "Keep On Loving You"). After several short beats, Cronin sings the opening lines in staccato, like he holding his breath and he's letting his words out a small group at a time. To make the break that we are on the brink of. Waiting here for you to take and drink of. To roll with the changes, yeah, yeah. One thing I love are songs that are meant to show off the band's different players, letting each one have a solo, showing off, you know? The J. Geils Band excelled in this, when you think of "Looking For A Love" or "Detroit Breakdown." "Roll With The Changes" was REO Speedwagon's version of this, stepping in with different toned-electric guitar solos and a wicked B3 organ turn. The whole thing keeps building more and more steam, cue the female background singers for "Keep on rollin', keep on rollin', oo-ooo-ooo!" Then three big final chords, the drummer slamming it all around for a long fill, a theatrical pause, and then that last C chord where guitarist Gary Richrath forces his sunburst Les Paul to scream the word "Wow" (something many a radio DJ have mentioned after spinning it). Here's the whole Speedwagon gang back then on the TV show "Midnight Special" getting the crowd whipped up on "Roll With The Changes." This is exactly the kind of music talk I was looking for... someone who can describe, in words, the structure of my favorite songs with passion and accuracy and a history lesson. Very impressive!